This unusual Greyhound Rescue theme piece is designed to shape a cross, using heat anodized, etched nickel silver and red brass. 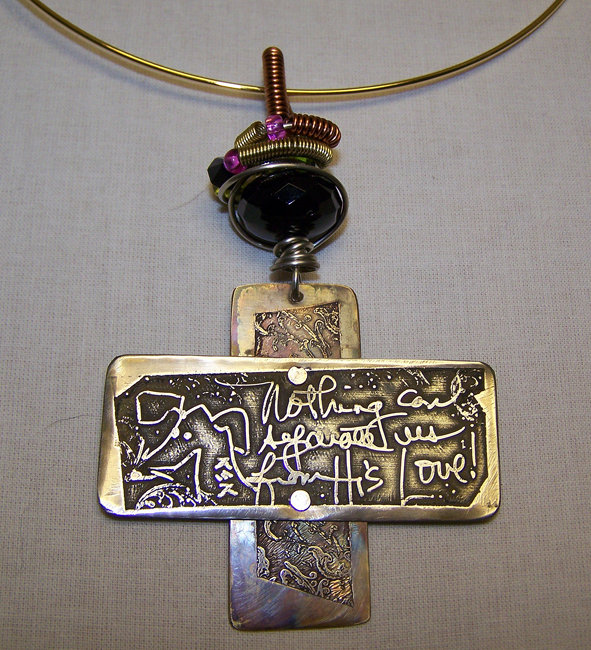 The free-hand design features a Greyhound profile and the hand-written words, "Nothing Can Separate Us From His Love," taken from Romans 8:38-39. The coiled wire bail has a faceted black crystal focal bead, with various crystal and light fuschia accent beads, and is extra wide to accomodate a variety of necklace options. Designed and completely hand fabricated by Mary(neck ring not included).